Of the 117 million people added to the population during this period due to the effect of new immigration, 67 million will be the immigrants themselves, 47 million will be their children and 3 million will be their grandchildren. By 2050, the nation’s racial and ethnic mix will look quite different than it does now. Non-Hispanic whites, who made up 67% of the population in 2005, will be 47% in 2050. Hispanics will rise from 14% of the population in 2005 to 29% in 2050. Blacks were 13% of the population in 2005 and will be roughly the same proportion in 2050. Asians, who were 5% of the population in 2005, will be 9% in 2050. 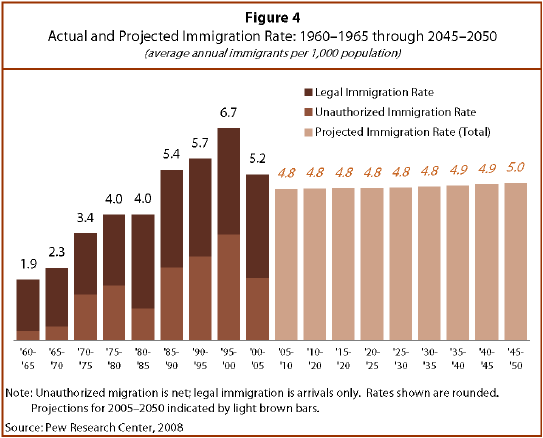 Immigration is projected to be the key driver of national population growth in the coming half century, but it is important to note that possible future changes in immigration policy or other events could substantially alter the projected totals. These projections are based on trends over the past half century, during which immigration, both authorized and unauthorized, has played an escalating role in U.S. population growth. From 1960 to 2005, new immigrants and their U.S.-born descendants accounted for 51% of population increase. In the later part of that period, from 1980 to 2005, new immigration accounted for 58% of the 68 million additional people. The heightening role of immigration contrasts with a decrease in fertility in recent decades. The average number of births per woman has declined markedly since the late 1950s, from more than 3.5 then to about 2 now. Also, a smaller proportion of women are of childbearing age now, compared with earlier decades. These two changes have made immigration a more prominent factor in population growth. The Center’s projections for the period from 2005 to 2050 are based on detailed assumptions about patterns in births, deaths and immigration—the three building blocks of population change. All population projections have built in uncertainties, especially for years further in the future, because they are based on assumptions about future behavior. In addition, these uncertainties can multiply because key aspects of population change are often interrelated—for example, a decline in immigration could also lead to a decline in the birthrate because immigrants tend to have larger families than do native born residents. The Center has developed three different population projections for 2050, but the body of this report presents findings from the main projection (figures from projections based on lower or higher immigration levels are set forth in a section that starts on page 23). These projections consolidate and build upon past trends, present conditions, and factors affecting future behavior. None of the projections should be treated as predictions. The country’s policies may change, as may the factors that influence birth, death and immigration rates. Even given these caveats, however, population projections are an important analytical tool for planners. A rise or decline in the overall population—as well as in particular age groups—will have important impacts on the nation’s tax base and workforce. Demographic change has major implications for government spending in key areas such as schools, health programs, community services, infrastructure and Social Security. Projections also provide business with a basis upon which to make judgments about future markets. And they are of increasing interest because of the role that population may play in climate change and other environmental concerns. 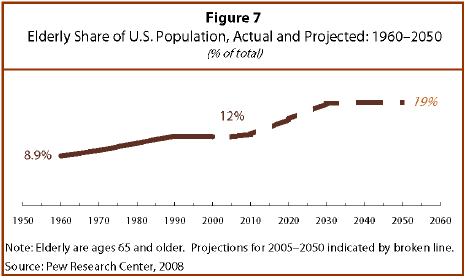 The Center’s projections use well established demographic methods and models to carry the population forward in time. The models and assumptions are disaggregated by race and by Hispanic origin, as are many projection models (e.g., Census Bureau, 2000). With regard to immigration, the Center’s projections also incorporate methods developed by Edmonston and Passel (1992, 1994) that differentiate the population by generation, i.e., the first generation (foreign-born), the second generation (U.S. natives with at least one immigrant parent) and the third-and-higher generations (U.S. native children of two U.S. native-born parents). For more detail, see the “Methodology” Appendix to this report. When incorporating birth estimates into the projections, the Center has assumed that the overall fertility rate will remain near the level it has been for the past three decades, with differing rates by race and ethnicity (Appendix, Figure A2). Birthrates are assumed to be well above average for immigrants, slightly above average overall for the second generation (U.S. natives with at least one immigrant parent) and below average for subsequent generations born in the United States. The Center’s fertility rate projections are virtually identical to those of the Social Security trustees and slightly lower than those of the Census Bureau. (Census Bureau, 2004; Social Security Administration, 2007). As for death rates, life expectancy is assumed to improve somewhat for all groups throughout the period covered by these projections. (Appendix, Figure A3) The Center’s projections employ Census Bureau assumptions about life expectancy gains, which are higher than those of the Social Security Trustees. Immigration to the United States has risen rapidly and steadily for decades as a result of increasing globalization and population movements, changes in U.S. immigration laws, the growing linkages of immigrant families within this country to communities abroad and labor market factors. Not only have the numbers of new U.S. immigrants increased over recent periods, but the rate of immigration also has risen steadily, whether measured from 1930, 1960 or 1980. In the face of these strong and persistent trends, most U.S. government projections, whether done by the Census Bureau (1996, 2000, 2004) or the Social Security Administration (2007) have assumed constant or even decreasing numbers of immigrants, implying sharp and sometimes immediate declines in the rate of immigration. As a result, official projections over the last several decades have consistently underestimated actual population growth. This rate of growth is in line with, but somewhat slower than, the growth trends of the last several decades. These immigration levels are slightly higher than those projected by either the Census Bureau or the Social Security Trustees in the short run and substantially higher toward the end of the projection horizon. Short-term fluctuations are likely to continue to occur, but the Center’s projections assume that those variations will be less important than the long-term trends. Although the rate is held steady in the Center’s projections, the number of new immigrants rises as the nation’s total population goes up. The projections also assume that several hundred thousand foreign-born residents will leave each year, which is in keeping with trends of the past several decades. Reflecting recent trends, the Center’s projections include a mix of new arrivals of legal permanent residents and unauthorized, or illegal, migrants, although the two groups are not broken out separately. 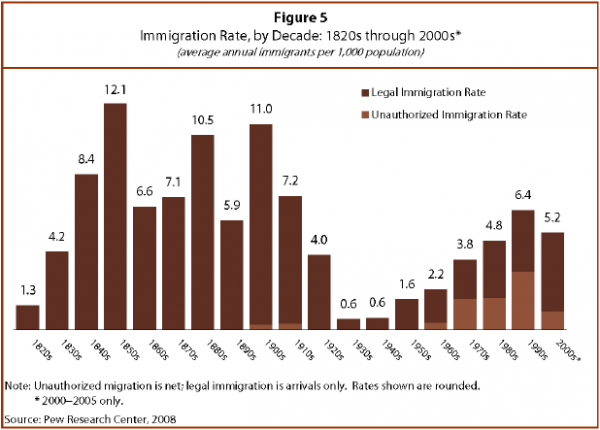 The issue of illegal immigration has become highly contentious in recent years. Last summer, Congress tried but failed to pass a comprehensive reform bill, and the debate over how to change immigration policies has become a major topic of the current presidential campaign. It is possible that a future Congress will enact laws that would sharply cut immigration flows. This has happened before. The Immigration Act of 1924 (along with an economic depression and a world war) drastically reduced immigrants as a share of the U.S. population from a 20th century peak of 14.7% in 1910 to a low of 4.7% in 1970. This report offers two alternative population projections in addition to its main projection. The alternatives are based on immigration levels roughly 50% above and 50% below the baseline projection, but use the same fertility and mortality assumptions as the baseline projection. Under the lower-immigration scenario, the population would rise to 384 million in 2050, and new immigration would account for 71% of growth during the projections period. Under the higher-immigration scenario, the population would go up to 496 million, and new immigration would account for 87% of the increase. The baseline projection shows the population will rise to 438 million, and new immigration will account for 82% of the increase. 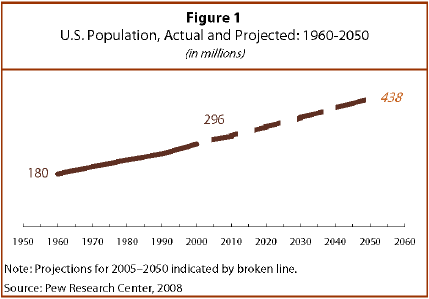 The Center’s main projection indicates that the nation’s population will grow 48% over the 2005–2050 period. That growth rate is lower than the 64% increase in the nation’s population from 1960 through 2005. The projected annual growth rate of 0.9% equals that of the 1980s but is lower than the pace of growth during other decades since the 1960s. The Center’s projections also indicate that between 2005 and 2050 the number of elderly will increase more rapidly than either the number of children or working-age adults.2 Immigration and births to immigrants in the United States will be responsible for all growth of other age groups but will have little impact on the number of elderly, which is affected mainly by the aging of the post-World War II baby-boom generation. 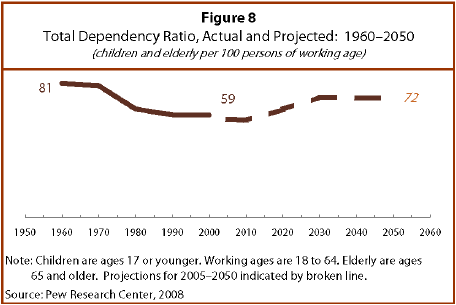 The relationship between the size of the working-age population, on the one hand, and the young and elderly on the other hand, is sometimes referred to as a nation’s “dependency ratio.” The Center’s projections show that the dependency ratio, which was 59 young and elderly for every 100 people of working age in 2005, will rise to 72 dependents per 100 people of working age in 2050. That means the costs per worker to support the young and elderly would go up. Under a lower-immigration scenario, the ratio would rise even higher, to 75 dependents per 100 people of working age. Under a higher-immigration scenario, it would be 69 dependents per 100 working-age people. In terms of international comparisons, the United States will continue to be the world’s third most populous nation in 2050, behind India and China, each with more than a billion people (United Nations, 2007). The projected annual growth rate for the United States will continue to exceed that in most other developed nations, which are growing at a slower pace, if at all. European countries generally are growing at no more than 0.5% a year, and some are losing population. As is true in the United States, the immigrant populations in many other developed nations have been growing rapidly in recent decades. The United States has a larger foreign-born population than any other country, but U.S. immigrants were a smaller share of the 2005 population (12%) than those in a few countries with long histories of receiving immigrants—including Australia at 20% or Canada with 19% (United Nations, 2006). Although immigrants are a larger share of the U.S. population than in most of Europe, some countries have a share of immigrants approaching that of the United States, including France (11%) and the United Kingdom (9%). This report begins by presenting the baseline projection for the total population from 2005 to 2050. The next sections go into detail about the projected estimates for key segments of the population, including the foreign born, Hispanics, blacks, Asians, non-Hispanic whites, working-age adults, children and the elderly. This report then examines how these changes will affect the size of the potential workforce relative to the number of elderly and young people. A final section presents the results of two alternative projections. This overview concludes with a summary of major projections. In the Center’s projections, each person is included in only one race or Hispanic category. These projections assume that definitions of race and ethnic categories will remain fixed and that self-identification does not change over time. In reality, the growing numbers of births to parents of different racial and ethnic groups, as well as changing social norms about racial and ethnic self-identification, are serving to blur the boundaries of racial/ethnic categories. Consequently, the future sizes of race/ethnic groups could be higher or lower than the projection values even if the underlying demographic assumptions about the future prove to be correct. 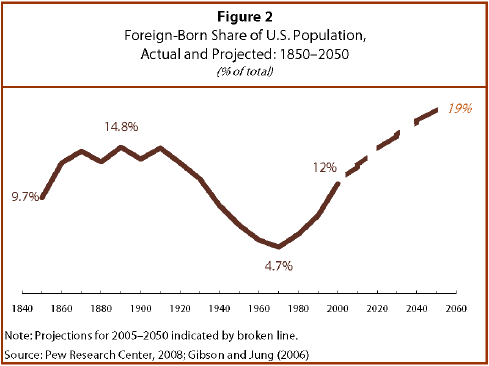 The foreign-born share of the nation’s population will exceed historic highs sometime between 2020 and 2025, when it reaches 15%. The historic peak share was 14.7% in 1910 and 14.8% in 1890. Births in the United States will play a growing role in Hispanic and Asian population growth, so a diminishing proportion of both groups will be foreign-born. The Hispanic population, 42 million in 2005, will rise to 128 million in 2050, tripling in size. Latinos will be 29% of the population, compared with 14% in 2005. 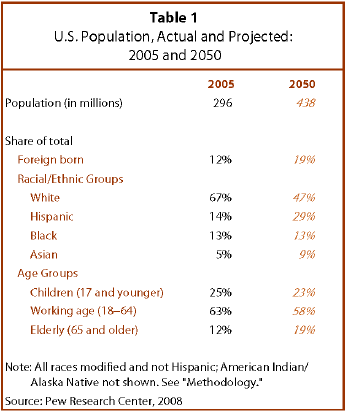 (Figure 6) Latinos will account for 60% of the nation’s population growth from 2005 to 2050. The black population, 38 million in 2005, will grow to 59 million in 2050, a rise of 56%. In 2050, the nation’s population will be 13.4% black, compared with 12.8% in 2005. The Asian population, 14 million in 2005, will grow to 41 million in 2050, nearly tripling in size. In 2050, the nation’s population will be 9% Asian, compared with 5% in 2005. Most Asians in the United States were foreign born in 2005 (58%), but by 2050, fewer than half (47%) will be. The white, non-Hispanic population, 199 million in 2005, will grow to 207 million in 2050, a 4% increase. 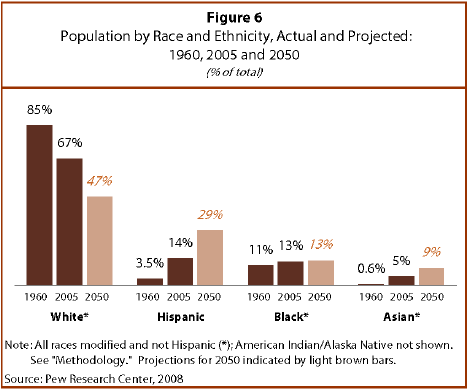 In 2050, 47% of the U.S. population will be non-Hispanic white, compared with 67% in 2005. The working-age population—adults ages 18 to 64—will reach 255 million in 2050, up from 186 million in 2005. This segment will grow more slowly over the projection period (37%) than the overall population. Future immigrants and their descendants will account for all growth in this group. Among working-age adults, the foreign-born share, 15% in 2005, will rise to 23% in 2050. The Hispanic share, 14% in 2005, will increase to 31% in 2050. The non-Hispanic white share, 68% in 2005, will decline to 45% in 2050. The nation’s population of children ages 17 and younger will rise to 102 million in 2050, up from 73 million in 2005. The child population will grow more slowly in future decades (39%) than will the overall population. Future immigrants and their descendants will account for all growth in this population segment. Among children, the share who are immigrants or who have an immigrant parent will rise to 34% in 2050 from 23% in 2005. The share of children who are Hispanic, 20% in 2005, will rise to 35% in 2050. Non-Hispanic whites, who make up 59% of today’s children, will be 40% of children in 2050. The nation’s elderly population—people ages 65 and older—will grow to 81 million in 2050, up from 37 million in 2005. This group will grow more rapidly than the overall population, so its share will increase to 19% in 2050, from 12% in 2005. 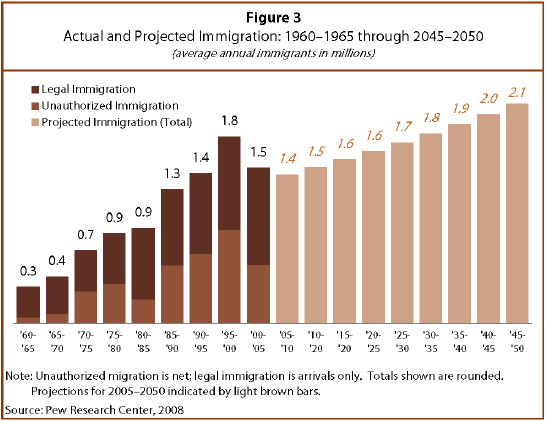 (Figure 7) Immigration will account for only a small part of that growth. Under a lower-immigration scenario, the total population would rise to 384 million, the foreign-born share would stabilize at 13% and the Hispanic share would go up to 26% in 2050. Under a higher-immigration scenario, the total population would rise to 496 million, the foreign-born share would rise to 23% and the Hispanic share would go up to 32% in 2050. Under a lower- or higher-immigration scenario, the dependency ratio would range from 75 dependents per 100 people of working age to 69 dependents per 100 people of working age. Both of these ratios are well above the current value of 59 dependents per 100 people of working age. The terms “Hispanic” and “Latino” are used interchangeably in this report. The terms “whites” “blacks” and “Asians” are used to refer to the non-Hispanic components of each population. “Children” refers to people ages 17 and younger. “Working-age” refers to people ages 18 64. “Elderly” refers to people ages 65 and older. “Foreign-born” refers to an individual who is not a U.S. citizen at birth or, in other words, who is born outside the U.S., Puerto Rico or other U.S. territories and whose parents are not U.S. citizens. The terms “foreign-born” and “immigrant” are used interchangeably. The terms “unauthorized immigrants,” “undocumented immigrants” and “illegal immigrants” are used interchangeably. Second: U.S. native (born in the United States or territories), with at least one first-generation parent. Third-and-higher: U.S. native (born in the United States or territories), with both parents native-born.